DeWALT DCS355M1 Oscillating Tool built with the latest powerful DeWALT brushless motor DeWALT state that this tough brushless technology delivers over 50% more more run time that standard carbon brush type motors. 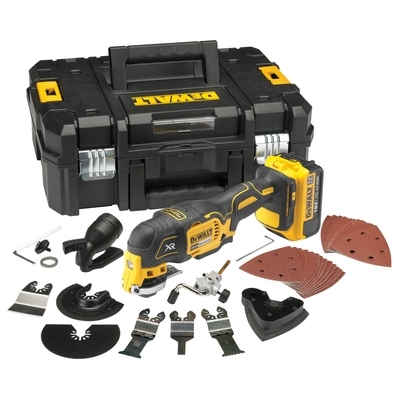 DCS355M1 DeWALT Oscillating Tools come with just a single 18v x 4Ah lithium battery including state of charge indicators, multi voltage charger, 35pce accessory set and strong T-Stak kitbox. The QUICK-CHANGE accessory system allows the trade to change blades and attachments to be swapped in and out quickly and safely without using tools, a dual grip variable speed trigger provides ultimate speed and safe application control. These DCS955M1 DeWALT Oscillating Tools use a depth control straight cut guide increasing cutting accuracy during detailed work plus a universal accessory adapter allowing use with most oscillating tool accessories. Included with these Oscillating Tools is a 35pce accessory kit allowing the trade to immediately utilise the kit as the kit includes accessories for cutting and sanding applications.